Populism to Kill the US Economy? Chitika - the 5th Search Engine? I recently had an email chat with Alden DoRosario from Chitika about the recent rapid growth of their ad network. They have been aggressively signing up bloggers and other independent publishers, and are now getting over 2 billion monthly impressions, with their behaviorally targeted Premium ads getting hundreds of millions of monthly search driven impressions, putting their search distribution network on par with Ask.com. How their premium ad network works is they target the ads to be relevant to search query that sent traffic to the publisher's site, thus even if the ads are not shown on a search page they still are seen by searchers right after they search and click through to the site. Alden gave me a link for a $75 bonus code for any publisher that makes $75 in commissions before the end of October. Publishers are paid 60% of the ad click value, with the house getting 40%. I just added their ads to my mom's weight loss blog. It looks like their ad network is not quite as deep as Google's but they do well for higher volume search queries. Most search engines are a backbone for an ad network, but it is hard to build query volume for a new search engine. Just look at how few people have used Wikia Search in spite of endless hype. 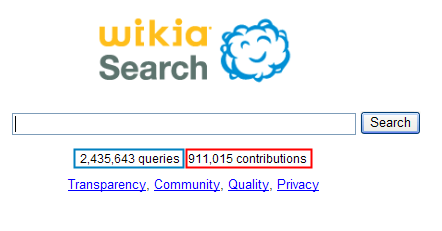 Wikia Search got a couple million lifetime searches whereas Chitika gets billions of monthly ad impressions. Most people do not feel they have a search problem, but many publishers feel their content could be monetized better. If you didn't have huge search distribution how would you create a search ad network? If an ad network grows big enough do you think they could do it the other way around, using their ad network distribution as a backbone to start a search engine? Disclaimer: The free $75 bonus is an affiliate link, but when I chatted with Chitika I pushed hard to get publishers the best payout bonus and longest payout bonus period possible rather than focusing on trying to maximize my commissions. After the fact search... that's an interesting way to look at it. Space for a Charity Search Engine? Following on from three posts - Wikia Search , Chikita and and the already infamous Cuil, I thought it wise to offer another perspective on searching, with search advertising profits going to charity. I know there is rectifi charity search engine but it's still relatively small compared to even the smallest open-source community-led and profit-making search engines. I think that rectifi site could use better messaging and site design if it aims to make a difference. And in most cases for most SEOs it makes sense to apply their talents to their own sites to create cashflow, then give away a portion of their cash flow to ideas and charities they feel are important. You have a good point. I've said in a recent post that I don't manage my own sites but am certainly playing around with the idea if days suddenly become longer that 24 hours! YetanotherBen is a busy bee! So naturally I'm not as astute on such topics, but am certainly interested. ...having a mention on a site such as '10% of profits goes to charity' helps get the occasional link and win the occasional heart but doesn't have the oomph of a full blown charitable project such as charitle search engine, I don't think. For shopping at least it seems to remove some of the guilt...maybe? I guess it depends on whether the project is set-up to raise the profile of the charitable causes, provide a guilt-free anti-commercial alternative search engine or simply to maximise donations (which maybe your model would be most suited). Interesting though. Thanks for sharing your view, Aaron. Certainly adds value to the debate. I was sent a generic email by Chitika for the sake of signing up SEO ROI Services to run their ads, based on their guess-timate of my traffic levels (or some random inaccurate tool's measurements; I know Compete is off and a friend using Google's recent planner tool was also waaaay off). My site does no product reviews unless they're seo related, and as I don't run display ads anyways, they're barking up the wrong tree. If that's the traffic they're after, perhaps their advertisers should be weary. Have you had a positive experience with their traffic, Aaron? I have not used them from an advertiser perspective yet. SEO stuff just never really gets clicked on (like I get ~ 0.05% CTR in AdWords). The other niche offers that I am currently advertising are usually being advertised as a link building mechanism...and thus they require hitting the right audience with really niche targeting...even AdSense has very little relevant inventory that is targeted enough to fill my needs on that front. Buying Google AdWords Ads on Brand Keywords?